Today, considering the expansion of universities and higher education centers is a significant number of students which are in adolescence. Entering into the university is considered as such an important period in the future life of these efficient and active collaborators. The World Health Organization defines the quality of life (QOL) as one's perception of his/her position in life, culture, and value system in which he/she lives in relation to his/her objectives, expectations, and standards, and according to this definition, most medical science experts believe that QOL is a multidimensional and subjective concept., In general, four basic domains of QOL are related to physical, psychological, social, and environmental health. Physical dimension is defined as physiological performance of the body and one's perception of his/her abilities. Psychological dimension includes balance and harmony of the person with himself/herself and others. The social dimension is related to the person's ability to communicate with others, and environmental health has concentrated on the individual's ability to exercise and perform daily activities which are observable., QOL is mainly associated with different variations in public and social relations of students, while along these changes, new roles formed in students' character after entering the university can be mentioned. Given all these problems, mental health which is an important aspect of students' QOL has high importance; however, it should be noted that this group is exposed to numerous stresses for reasons such as special age and social position. Tension factors such as being away from home and separation from family, new lifestyle, irregular sleeping and waking hours, payment of fees, uncertain job future, educational problems, competition with other students, lack of interest in discipline, high volume of classes, and lessons could have a significant impact on their QOL.,, The results of Soltani et al. 's research showed that 4% of students had very inappropriate QOL, 51% had moderate, and 11% of students had inappropriate QOL. The results of the Tol et al. 's study on the lifestyle showed that the general QOL of 40.7% of the students was good and only 19.8% of them had moderate QOL. Since most students, especially female students, are in vulnerable period of their lives and living in the dorms will form an important part of their lives, the probability of psychological damages in them has naturally increased and may have direct effect on their QOL, so we decided to conduct this study aimed at investigating the QOL in female students living in dormitories of the University of Medical Sciences in Qom. This study is a cross-sectional study conducted on female students living in dormitories of the University of Medical Sciences in Qom. The study population consisted of female students studying in Qom University of Medical Sciences living in dormitories in December 2016. The data sampling method was quota that of 300 students, 87 students were from the faculty of medicine, 42 students were from nursing and midwifery, 48 students were from the faculty of paramedics, and 122 were from public health. Data were gathered using the World Health Organization QOL-BREF questionnaire containing 26 items in four domains of physical health (energy and fatigue, pain and discomfort, sleep and rest, 7 items), psychological health (body image and appearance, negative feelings, positive feelings, self-esteem, thinking, learning, memory, and concentration, 6 items), social health (personal relationships, social support, sexual activity, 3 items), and environmental health (financial resources, information and skills, recreation and leisure, home environment, access to health and social care, physical safety and security, physical environment, transport, 8 item) so that each question item was scored based on the Likert scale from 1 to 5 and first two questions are not related to any of the areas and assess overall QOL; therefore, scores of 4–20 were considered separately for each dimension, accordingly, high QOL (score 16 and more), middle QOL (score 12–16), and low QOL (under 12 score) classified. Finally, after obtaining informed consent from the students, questionnaires were completed by self-report method. Validity and reliability of the questionnaire were previously confirmed by Nejat et al. in Iran calculating Cronbach's alpha coefficient as 0.7. Data were analyzed using descriptive statistic and Pearson and Spearman correlation coefficient and statistical software SPSS software version 18 for windows (SPSS Inc., Chicago, IL, USA) and P < 0.05 was considered as significance level. The mean age of students was 21.64 ± 3.50 years and mean educational average was 16.71 ± 1.51 that most students were single and at bachelor's degree and the response rate of participants was 300 people. In general, in the four domains of QOL, the highest mean score among students was related to physical health, and the lowest mean score was associated with psychological health [Figure 1]. Pearson and Spearman correlation coefficient showed that there was a weak significant relationship between QOL and demographic variables [Table 1] and statistically significant difference was observed between single people (7.2 ± 48.61) and married people (10.53 ± 2.38) with social domain of QOL so that married people had a higher score. This study showed that in general, QOL of students at all the four domains was in the middle range, and in four domains of QOL, the highest mean score was associated with the physical health and the lowest score was related to psychological health that this is consistent with the findings of several studies.,,,, In a study conducted by Yazdi Moghadam et al., nursing students had average QOL in both physical and mental health. Furthermore, in a study of medical students of Kans Lithuania and Demont's study, mean QOL in the dimension of physical health among four dimensions had the highest value that was consistent with the present investigation., According to this study and mentioned studies, attention to the domain of physical health has been more than any other domains and according to the fact that all dimensions of QOL affect each other and the mean QOL in all domains of the present study was close to each other and there was not so much difference between the areas, all domains of QOL should be given special attention. The results showed there was a significant relationship between QOL and age while Asarodi et al. demonstrated that aging has no effect on QOL  except in the social dimension that the QOL is promoted with increased age. According to Yazdi Moghadam et al., there was no significant relationship between age and physical and mental aspects of QOL. The reason for the difference in results can be different age features in two studies. The findings of this study showed statistical significant relationship between discipline and interest in discipline with QOL. According to the admissions system in Iran, thorough examination and considering the fact that continuing education for many adolescences is a way to provide jobs in the future. Thus, adolescences are merely trying to enter the university but they do not have much of information about the job future of their discipline; thus, after a while, they conclude that they are not much interested in their field; however, in the present study, about 83% of students were interested in their field of study, that is, inconsistent with Paro et al. 's results. There was also a statistical significant relationship between QOL and economic status as, the improvement in economic status, particularly monthly consuming costs of the students may have a positive impact on benefiting from the quality of their lives., It was shown in a study by Khaled et al. that those with higher income levels and more prosperous have higher QOL. This is despite the fact that in numerous other studies, no significant relationship has been found between QOL and economic status ,,, that the cause of this difference may be due to differences in the study population. In the present study, statistical significant difference was observed between single people and married people with social domain of QOL so that married people had a higher score. Makvandi and Zamani also showed that in all subcomponents related to social health, married students had better status than single students. Furthermore, according to studies conducted by Cairney et al. and Bakhshipour Roudsari et al., it could be said that, since, married people unlike single people have higher life satisfaction and social support, so in order to reduce stress, depression and to increase social support for single persons, conditions can be provided in line with their marriage as a preventive and positive measure., One of the present study limitations is that the statistical population is female students living in the dormitories who are in a special age range that it can limit the result generalizations, so doing future studies in other groups is suggested. According to the present study, the lowest domain of QOL was related to psychological health; therefore, to increase the QOL in this domain, periodical evaluation of the mental health is recommended. Furthermore, appropriate training to create psychological compatibility in student dormitories and proper communication with others can improve the QOL. Thereby, almost all the students who participated in this study are sincerely appreciated. This article is the result of the research project No. 34 P/12618, which is approved by the Research Ethics Committee of the Qom University of Medical Sciences, Qom, Iran. Abediny S, Davachy A. Prevalence of depression in nursing and medical students Hormazgan University of medical sciences. HMJ 2006;11:139-51. Rettek SI. Cultural Differences and Similarities in Cognitive Appraisal and Emotional Response New School for Social Research [Dissertation]; 1990. World Health Organization's Quality of Life Group. Measuring Quality of Life Development of the World Health Organization Quality of Life Instrument; 1992. World Health Organization's Quality of Life Group. WHOQOL-BREF: Introduction, Administration and Scoring, Field Trial Version; 1996. Donald A. What is quality of life? Clinical lecture in epidemiology. Univ Coll 2001;1:1-5. Eriksson LE, Nordström G, Berglund T, Sandström E. The health-related quality of life in a Swedish sample of HIV-infected persons. J Adv Nurs 2000;32:1213-23. Forotany M. Mental health status of college students in higher education Larestan city. Scientific and Nasibeye Mazandaran nursing and midwifery school. IJN 2006;9:51-4. Byars JL. Stress, Anxiety, Depression, and Loneliness of Graduate Counseling Students: The Effectiveness of Group Counseling and Exercise [Dissertation]. Tech University Texas; 2005. Abolghasemi A. Assessment of the relationship between stressors student with academic performance in students according to religious attitudes. J Educ 2008;3:2-8. Cavanagh SJ, Snape J. Educational sources of stress in midwifery students. Nurse Educ Today 1997;17:128-34. Soltani R, Kafee M, Salehi E, Karashki H, Rezaee S. Survey Quality of Life university students. J Gilan Univ Med Sci 2010;75:25-35. Tol A, Tavasoli E, Sharifirad GH, Shojaezadeh D. Assessment lifestyle of health promotion and its relationship with quality of life in students expert school of public health Isfahan University of Medical Sciences. J Health Syst Res 2012;4:1-6. Nejat S, Montazeri A, Holakoe naeeni K, Mohammad K, Majdzadeh SR. The World Health Organization questionnaire Standardization: (WHOQOL-BREF) Translation and psychometric Iranian version. J Sch Public Health Inst Health Res 2007;4:1-12. Demont-Heinrich C. The association between physical activity, mental health and quality of life: A population-based study. Healh Watch 2009;71:1-4. Nikbakht Nasrabadi AR, Mazlom R, Nesari M. Relationship domains worry of quality of life. Q Payesh 2009;1:85-92. Hadi N, Malek Makan L. Assessmsnt of health status and quality of life of primary school teachers in Shiraz. J Hormozgan Med 2007;4:362-87. Yazdi Moghadam H, Estaji Z, Headari A. Assessment of the quality life of nurses in hospitals in Sabzevar. J Sabzevar Univ Med Sci 2008;1:50-6. Khaled S, Suhair A, Husein J, Luai A, Raed A. Quality of Life (QOL) among university students in Jordan: A descriptive study. JEP 2013;4:161-7. Pagnin D, de Queiroz V. Comparison of quality of life between medical students and young general populations. Educ Health (Abingdon) 2015;28:209-12. Zhang Y, Qu B, Lun S, Wang D, Guo Y, Liu J, et al. Quality of life of medical students in China: A study using the WHOQOL-BREF. PLoS One 2012;7:e49714. Alibeike F, Ahmadi A, Farahbakhsh K, Abedi A, Alibake M. The effect of optimism training on quality of life among dormitory female students at Isfahan medical university. IJMS 2012;12:709-19. Shokohi S, Hamid N, Sodani M. Effectiveness of psychological hardiness training on quality of life female students in teacher training. Knowl Res Appl Psychol 2013;14:14-25. Viola Arronqui G, do Valle Bóz Lacava RM, Fustinoni Magalhães SM, Goldman RE. Perceptions of nursing students on their quality of life. Acta Paul Enferm 2011;24:762-5. Asarodi A, Golafshani A, Akaberi A. Relationship between mental health and quality of life in nurses. J N Khorasan Univ Med Sci 2011;3:79-86. Nuss MA, Reger-Nash B, Williams K, Yasek V, Juckett G, Richards T. Medical student perceptions of healthy lifestyles: A qualitative study. Calif J Health Promot 2004;2:127-34. Zarghami M, Khademloo M, Sheikhmoonesi F, Behroozi B. Quality of life enjoyment & satisfaction in medical students and natural resources students. J Mazand Univ Med Sci 2012;22:42-8. Pasdar Y, Eizadi N, Safari R. Effective factors on the quality of life in female students of Kermanshah university of medical sciences. Sci J Ilam Univ Med Sci 2012;21:33-41. Gashtasbi A. Evaluation of health-related quality of life in Tehran. Proc Nation Conf Qual Life Tarbiat Modares Uni 2004;23:85-90. Amiri M, Chaman R, Khamseh A, Rezaee N, Manochehri Moghadam ZH, Rohani H, et al. A study of the life quality of students at a university of medical sciences in the Northeast of Iran. Knowl Health 2014;8:176-80. Salehi T, Dehghan Nayeri N. Relationship between anxiety and quality of life in students living in dormitories of Tehran University of Medical Sciences. Payesh 2011;10:175-81. Makvandi S, Zamani M. The survey of quality of life and its dimensions in Islamic Azad University Ahvaz branch students. J Jentashapir 2010;2:191-200. Cairney J, Boyle M, Offord DR, Racine Y. Stress, social support and depression in single and married mothers. Soc Psychiatry Psychiatr Epidemiol 2003;38:442-9. Bakhshipour Roudsari A, Peyrovi H, Abedian A. 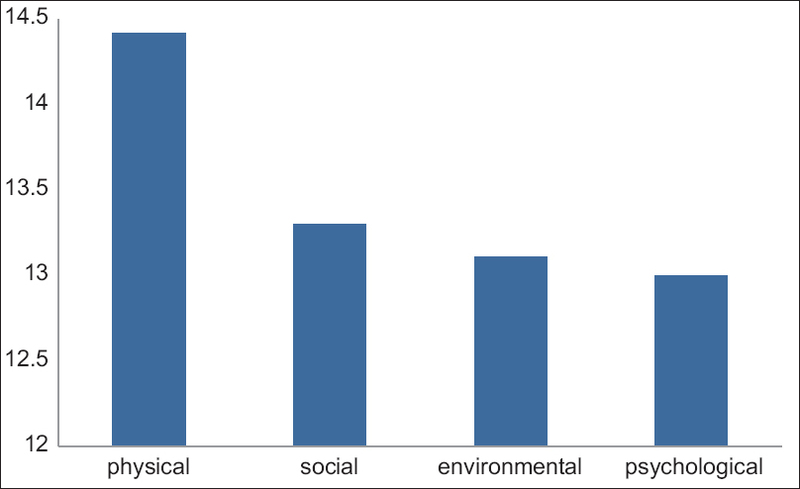 Investigating relationship between satisfaction with life and social support with mental health among freshman students of Tehran university. Q J Fundam Ment Health 2005;7:145-52.